HOME ON GEORGE suitable for families or for business trips - with its traditional Georgian facade delightfully opens into a spacious modern interior. Home comforts provide a place where you, your family and friends can truly relax during your stay. The large living spaces are ideal for larger families, and for small reunions for those special celebrations. You have the entire home to yourselves. 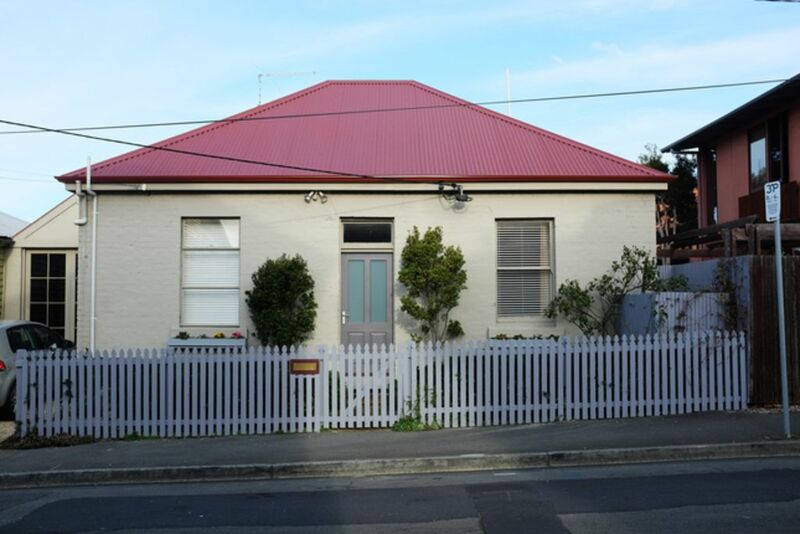 You are close to NORTH HOBART cafes, pubs, restaurants, State Cinema, galleries and shops. It is only a 5 minute walk away. The house is in a quiet street, in a friendly neighbourhood and once you are inside you have total privacy. If you are heading to the city for theatre, concerts, shopping, dining and sightseeing then it is just a 20-minute walk. Take you car and it is only 5 minutes with parking available in numerous council and private car parks at very reasonable rates. The buses to the city on Metro buses are every 10 minutes at bus stops on Elizabeth Street. Home on George has 3 LARGE BEDROOMS with queen or double beds and there is also a single bed in one of the rooms downstairs.. Each bedroom has a heater, wardrobes, bedside tables and lamps, and other furniture. The main bedroom upstairs is a lovely space, with an adjoining ensuite and opening onto a private rooftop deck with great views. There is also a television in this bedroom. The two BATHROOMS have fantastic showers, a toilet and hand basin / vanity and room for all your personal toiletries, etc. Shampoo, conditioner and soap are supplied. Our KITCHEN is well supplied with all the pots, pans, non-fat griller, utensils, dishes, glasses, cutlery and serving plates, coffee plunger, tea pots, etc that you will need if you want to cook and entertain. The kitchen window opens to a view of the private courtyard garden; it also flows to the dining table in the LIVING ROOM. The SPACIOUS LIVING ROOM is furnished with a large comfy leather lounge, a lovely sofa and armchair and tables, lamps and storage cupboards. This room is heated with a heat pump (air conditioner in the summer if you need it) and a wood-heater lookalike fueled by natural gas which gives the room a lovely warmth and cosy feel. There is a drawer full of DVDs, books, magazines, maps and some board games for you to enjoy. You can wash your clothes in the LAUNDRY in the front loader washing machine. There is also a laundry trough, a clothes dryer and out door drying lines. An ironing board and iron are here for you to use too. For your YOUNGSTERS we can provide a porta cot, high chair and safety gate on the stairs. Please let us know if you would like us to put the baby gear out for you. HOUSE TRAINED PETS are welcome and we have a medium sized PVC dog kennel available if required. It is a short walk to SOUNDY PARK or a little longer up to QUEEN'S DOMAIN for you to exercise your dog. We do however expect you to pick up after your pooch any excess hair that it may have shed. For your CONVENIENCE you will find the SUPERMARKET close by, a choice of BOTTLE SHOPS, PETROL STATIONS and other everyday shops such as WINNINGS NEWSAGENT in Elizabeth Street. The MINIMUM STAY is 2 nights. CHECK OUT: 10am CHECK IN: 2.30pm onwards; there are also parking spaces in the street in Mon - Fri 3 hr and 2 hr time zones which are unmetered and free. When you stay you will enjoy close proximity to some great short walks and short driving distances to Hobart attractions whether they be in the city, the bush, up Mt Wellington or on the Derwent River. We look forward to welcoming you at HOME ON GEORGE one day. This was my 1st 'HomeAway Stay' and it was fantastic. Location, excellent, and very quiet. The house, excellent. Everything you could ever want was provided - the kitchen was so well equipped. There was milk, fruit, wine etc, all provided on arrival!!!!!!! Each person slept extremely well, including myself in the beautiful loft with ensuite. The owners were only too happy to make our stay as pleasant as possible, without imposing on our privacy. As I said, couldn't ask for more. Thanks, we're very pleased that you found everything you needed. Sounds like you enjoyed staying and we appreciated you leaving the house clean and tidy. Maybe we'll see you back at Home on George. This house is perfect for anyone visiting Hobart. Great location for exploring. Space to park the hire car. Clean. Well furnished. Will definitely think of renting it again if I manage to come back with my wife and kids. We stayed for four nights and wish we could have stayed much longer. Step inside and what appears a small home from the street opens up from a hallway to a spacious open plan lounge dining kitchen, a lovely protected private patio, good sized bedrooms and stairs up to another bedroom and bathroom and rooftop patio. The layout is superb and very cleverly designed, furnishings are excellent, and the interior finished to a high standard. Beds are excellent, great showers, interior is very quiet, well equipped kitchen. Located in a nice area, very close to many restaurants and cafes, and an interesting walk to downtown along Elizabeth St and then through the shopping precinct. And the owners - they are absolutely lovely and extraordinarily helpful. Beautiful home and fabulous location!! This cottage is beautiful. It's size is deceptive as it looks small from the front aspect but opens into a warm, welcoming and roomy home. Every comfort is provided, we couldn't have asked for more. It is located within easy walking distance to North Hobart's restaurants and cafes and only a short drive to the Waterfront district. Thank you for sharing your corner of Tasmania with us. Warm welcome, EXCELLENT fit out, Internal dimensions larger than expected. Despite an earlier-than-arranged arrival, Christine welcomed us to this beautiful home without fuss. Photos on the website can't do justice to the property. With a large living area, courtyard AND upstairs "rooftop" decked courtyard, light-filled and thoughtfully fitted and furnished, the property would comfortably accommodate 3 couples (we had 2 plus myself single). I will be back. Many thanks. Rod or I always try to meet our guests soon after their arrival to acquaint them with the house and surrounds. We are glad you were all comfortable and had all the space you needed to relax after your busy days. One day we'll update the photos but meanwhile as well as the spaciousness and lovely private outdoorspaces you mentioned, we have upgraded some of the furniture, etc and it is great to hear that you and your friends all appreciated what Home on George offers whilst staying in Hobart. Great spot and perfect location. Our fur baby enjoyed it just as much as we did. We will be back.